During the machining process of the workpiece to give it a desired shape, metal chips are produced. The chips formed may be of continuous, discontinuous and continuous with built up edge type. The types of chips formed in machining process depends upon so many factors, we will discuss it later. Basically there are three types of chips produced in the metal machining and these are continuous, discontinuous and continuous with built up edge. If the metal chips formed during machining is without segments i.e. 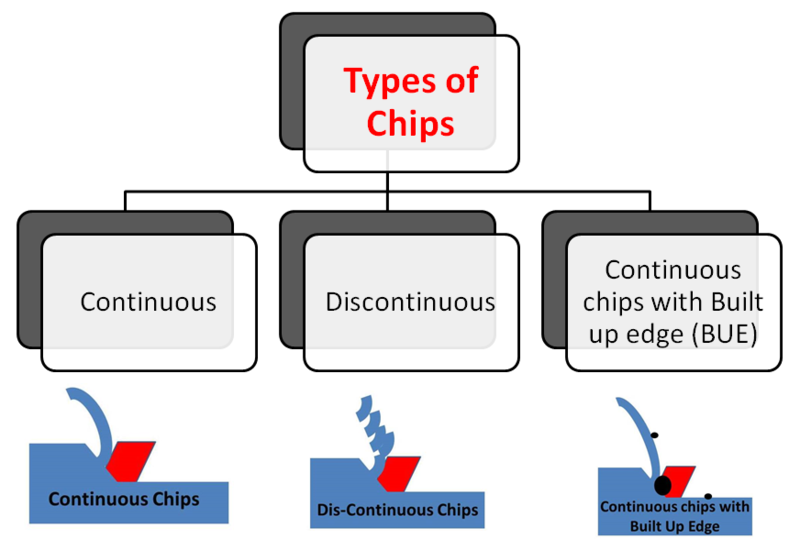 without breakage, than it is called as continuous types of chips. Continuous chips are formed when the ductile material is machined with high cutting speed and minimum friction between the chip and tool face. (i) Ductile material like mild steel is used. (ii) Bigger rake angle of the tool. (iv) Minimum friction between the chip and tool interface. (v) Small depth of cut. • Better surface finish to the ductile material. • Less heat generation due to minimum friction between the tool face and chip. • Long tool life due to less wear and tear. If the chips formed during machining process is not continuous i.e. formed with breakage is called discontinuous chips. Discontinuous types of chips are formed when hard and brittle metals like brass, bronze and cast iron is machined. (ii) Small rake angle of the tool. (iv) High friction forces at the chip tool interface. (v) Too much depth of cut. The formation of discontinuous types of chips in brittle materials provides good surface finish, increases the tool life and reduces the consumption of power. When discontinuous chips are formed in the ductile materials, the workpiece result in poor surface finish and excessive wear and tear of the tool takes place. Continuous chips with built up edge is formed by machining ductile material with high friction at the chip-tool interface. It is similar to the continuous types of chips but it is of less smoothness due to the built up edge. How Built Up Edge is Formed? When the chip is flows in upward direction and high friction is exist in between the interface of the chip and tool. Due to the high friction between the chip and tool a very intense heat is generated at the nose of the tool. The compressed metal adjacent to the tool nose gets welded to it. This compressed metal welded to the nose is called built up edge. When the chip flows through this built up edge, it gets broken and carried away by the chip and called as built up edge chips, the rest of the built up edge is adhere to the surface of the workpiece and makes it rough. Due to formation of the built up edge the rake angle of the tool gets changed and so is the cutting force. (iv) Lack of coolant and this increase the friction between the chip tool interfaces. The making of the BUE has one advantage i.e. it protects the tool from getting damaged from high friction and temperature generated during machining process and hence the tool life increases. The formation of these types of chips results in rough surface finish, change in the rake angle and cutting forces.